Please note that all of the information contained on this page was found at www.prisonersofgreed.org They have done such a phenomenal job of compiling all of the puppy mill facts that we don’t believe there is any reason to re-invent the wheel. We encourage everyone who has clicked on this page to visit their website, share the knowledge and link with others, donate generously to their organization…and last but certainly not least, opt not to shop! Have you ever wondered where that cute little puppy in the pet shop window came from? Have you ever looked at that little pet shop puppy you bought and thought, “I bet your parents were beautiful”? Do you think of your puppy’s parents living the life of luxury on someone’s couch being pampered? Ever wondered just what that puppy mill is that the “crazy rescue lady” keeps talking about? Wonder no more! ​Puppymills – A National Disgrace Hundreds of thousands of puppies are raised each year in commercial kennels. Puppy mills are distinguished by their inhumane conditions and the constant breeding of unhealthy and genetically defective dogs solely for profit. Very often the dogs in puppymills are covered with matted, filthy hair, their teeth are rotting and their eyes have ulcers. We have seen many dogs whose jaws have rotted because of tooth decay. The dogs are kept in small wire cages for their entire lives. They are almost never allowed out. They never touch solid ground or grass to run and play. Many of the dogs are injured in fights that occur in the cramped cages from which there is no escape. Many dogs lose feet and legs when they are caught in the wire floors of the cages and cut off as the dog struggles to free themselves. 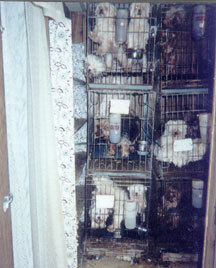 Very often there is no heat or air-conditioning in a puppymill. The dogs freeze in the winter and die of heat stroke in the summer. Puppies “cook” on the wires of the cages in the summer. Female dogs are usually bred the first time they come into heat and are bred every heat cycle. They are bred until their poor worn out bodies can’t reproduce any longer and then they are killed. Often they are killed by being bashed in the head with a rock or shot. Sometimes they are sold to laboratories or dumped. This is often by the time they reach five years old. Puppy mills maximize their profits by not spending adequate money on proper food, housing or veterinary care. 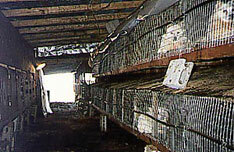 The food that is fed in puppy mills is often purchased from dog food companies by the truck load. It is sometimes made of the sweepings from the floor. It is so devoid of nutritional value that the dogs’ teeth rot at early ages. Dogs in puppymills are debarked often by ramming a steel rod down their throats to reputure their vocal cords. Puppies are often taken from their mother when they are 5 to 8 weeks old and sold to brokers who pack them in crates for resale to pet stores all over the country. The puppies are shipped by truck or plane and often without adequate food, water, ventilation or shelter. Innocent families buy the puppies only to find that the puppy is very ill or has genetic or emotional problems. Often the puppies die of disease. Many others have medical problems that cost thousands of dollars. And many have emotional problems because they have not been properly socialized in the mills. Don’t bring this misery into your home. There are over 4000 federally licensed breeding kennels. ​ mill and pet store connection. Buying a puppy in a pet store has significant risks for the purchaser and their family. A state funded survey in California found that nearly half of the puppies sold in pet stores were sick or incubating diseases. This doesn’t count the ones suffering from genetic diseases. Imagine bringing a puppy home from a pet store only to have it die from parvo and cost thousands of dollars in vet expenses because of genetic problems like hip dysplasia. Some dogs are so psychologically scarred from the mind numbing boredom of being imprisoned in a small cage for year and years that they have developed repetitive habits like going round and round in circles for hours and hours or barking at the wall for hours.